Every now and then a blind squirrel gets a nut, and this time I hit the jackpot! 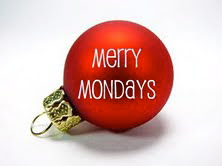 It all started when Claire over at Claire Cooks invited me to participate in Merry Mondays. For the next four Mondays, there's a theme ingredient and this Monday it's cranberries. I've been racking my brain trying to come up with a recipe that didn't involve cranberry sauce and lo and behold...I think I have a masterpiece (even if I do say so myself)! I stuffed this beautiful pork loin roast with a mixture of dried cranberries, dates, walnuts, sage, and goat cheese. The combination was heavenly. In medium bowl, mix goat cheese, cranberries, dates, sage, walnuts and kosher salt. Place mixture inside butterflied pork loin, close pork loin around the mixture. Use kitchen twine to tie and hold tight. Seal end with skewers, if desired. This will help hold the cheese mixture inside. Bristol Farms has gorgeous pork loin roasts! Rub outside of tied pork loin with olive oil, then sprinkle with salt and fresh cracked pepper. Place seam side down in baking dish or pan. Place in oven and roast for approximately 6o minutes or until internal temperature reaches 160 degrees F.
Allow to rest for about 10 minutes, then cut the twine off and serve. I cannot even describe how good this was. 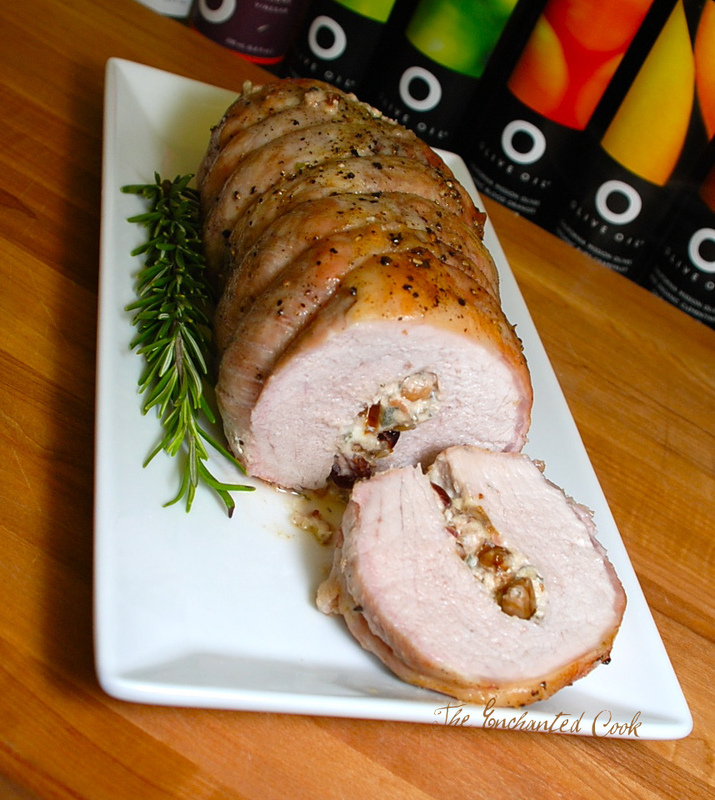 The creamy filling is rich and adds so much to the pork loin roast. The olive oil, salt and pepper really enhance the flavors, too. This would be a great addition to any holiday meal. a masterpiece indeed! this looks amazing! it is 8 am and i am drooling! i love the step by step photo that shows how you closed that puppy up. As someone who has never stuffed anything, this is so helpful. Veronica this looks so good, outstanding! Great photos too! I need a pork loin! I love how you used the cranberries in a savory dish! Nothing like a good pork loin for dinner. Thanks for the inspiration! I love stuffing and rolling meat! I make a mean braciola and also a great rouladen! i even butterfly and stuff chicken breasts. It's not that hard to do and the final product is beautiful- just like your meal here! This looks really, really nice.... great idea to add the goat cheese! This looks awesome!!! I'm printing it:) Thanks!! I love pork loin and this one is beautiful! wow this looks great..you are so talented!..thanks for sharing this. What a BEAUTIFUL pork dish!! And I'm a sucker for all things goat cheese! My family and I love pork loin. It's so lean and eager to adapt to sooooo many flavors. Great recipe and once again great picture. Thanks! Hi Julie - Greek feta would be delicious or you could use cream cheese. If you don't like cheese, bread stuffing would be great, too! I love cheese, I think the cream cheese would be super...thanks! Hi Letizia - This mixture is excellent in butterflied chicken breasts as well! The technique would be good for a beef tenderloin but you'd probably want to tweak the ingredients in the mixture to complement beef. I have to tell you again, your Sleek Greek meal looks amazing and your tips and photos showing how to prepare octopus are so awesome! Tracy Wood, December 6th, could you post your braciola and rouladen recipes?